Members of the Delhi High Court Bar have come together to organise a monthly lecture/discussion series. In each monthly lecture/discussion, a legal issue of topical significance will be selected and a panel of three speakers from among the judges and senior advocates shall be invited to speak on various aspects of the issue. The floor will then be open to the audience to share brief remarks and ask questions. The committee formed to organise the lectures includes Kirti Uppal, Senior Advocate; Pinky Anand, Senior Advocate; Vikas Pahwa, Senior Advocate; Geeta Luthra, Senior Advocate; Vijay Sondhi, Kajal Chandra, Madhu Tewatia, Advocate; Nandita Rao, Peeyoosh Kalra, Amit Saxena, Anu Mehta, Anu Narula and Rubinder Ghumman. The topic for the first lecture is ‘Understanding the Unlawful Activities Prevention Act 1967’. 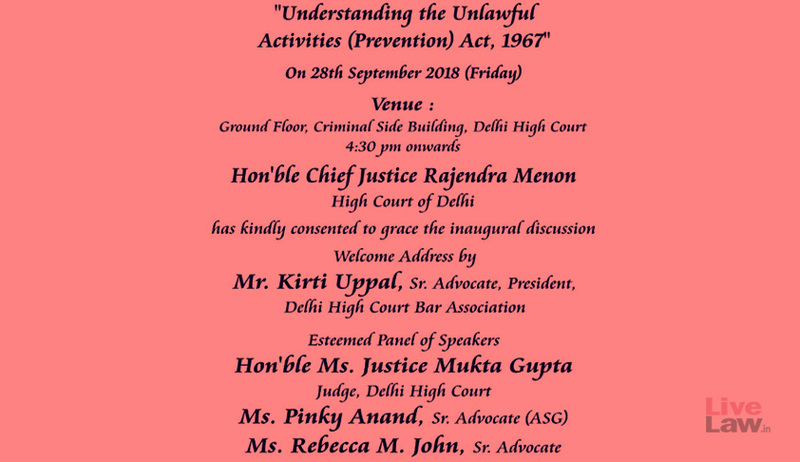 The welcome address will be delivered by Kirti Uppal, Senior Advocate and president, Delhi High Court Bar Association. The Thank You Note will be delivered by Geeta Luthra, Senior Advocate. The flyer can be accessed here.